Ubuntu ‘recently’ deprecated jockey and moved to ubuntu-drivers-common. 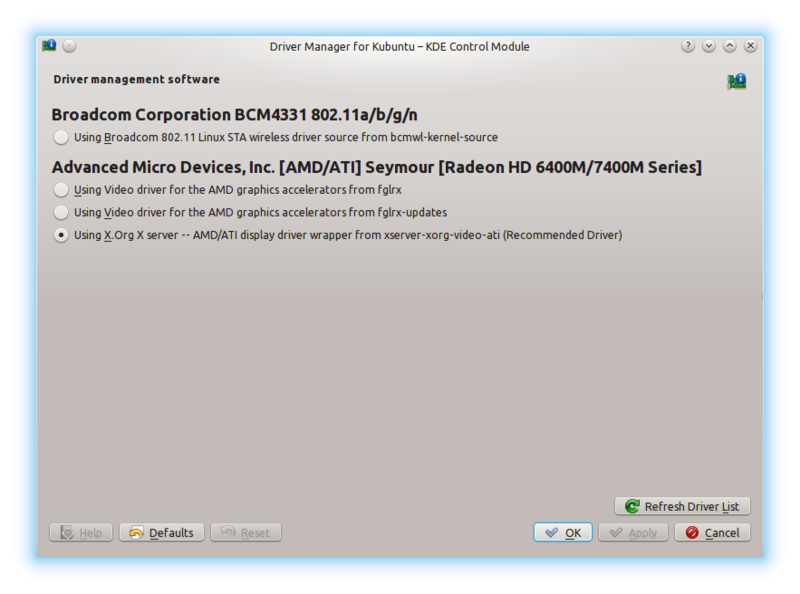 ubuntu-drivers-common is a python backend which will try to figure out which drivers are best suited to your system. Up till Kubuntu 13.10 we were still relying on the backend called Jockey which is python2 , however for the 14.04 cycle, one of our major tasks was to rehaul the driver manager interface and use the fancy new ubuntu-drivers-common backend which is python3 based. By leveraging this new backend, we are now at feature parity with Ubuntu when it comes to driver handling. Packages are now available to trusty users and can be acquired by installing the ‘kubuntu-driver-manager’ package. Have to say, I’m glad about this. It was a little embarrassing to “Additional Drivers” and have the exact same description for each of the four drivers offered. And, it looks good. Well done! Does it provides a way to manage the drivers from terminal as jockey does? Thank you. It seems more user-friendly than jockey-text.